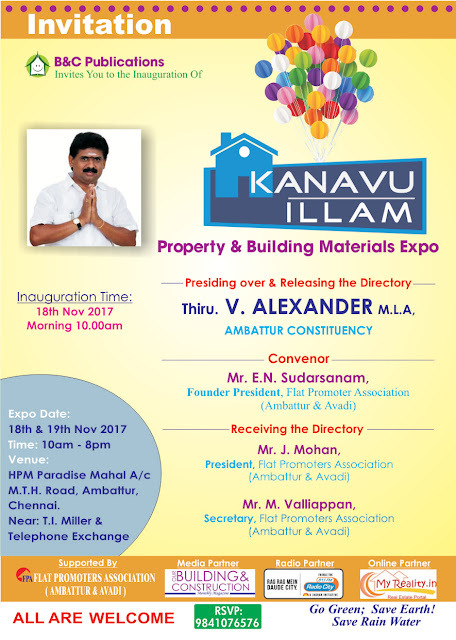 B & C Events, a popular Chennai-based expo organizer, is conducting Kanavu Illam Expo 2017 at Ambattur. 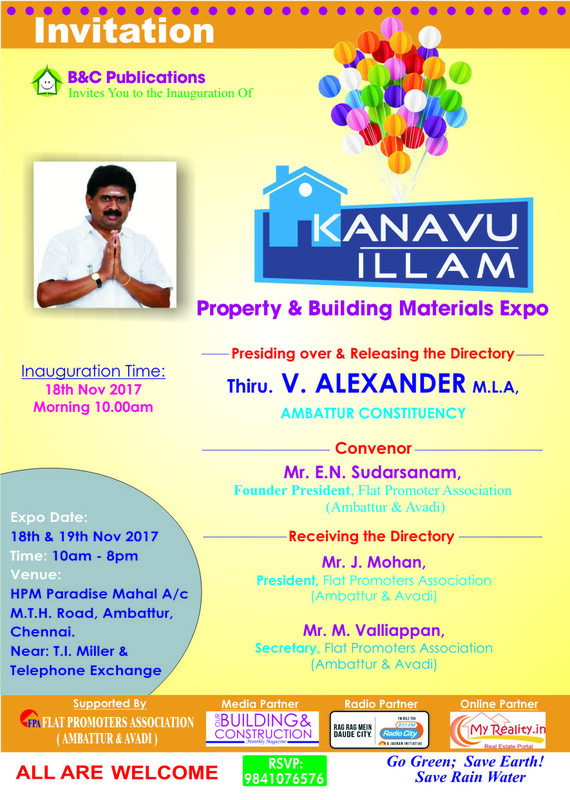 The fair is to be held on 18th and 19th November at HPM Paradise Mahal, MTH Road, Near Telephone Exchange, Ambattur, Chennai and will be open between 10 am and 8 pm. Entry is Free. For details, call: 94441 31213. A means to know the hottest trends and developments, the fair in a 400 sq m space is to bring more than 150 projects in 70 stalls. Over 60 leading builders and developers will be showcasing projects pertaining to Anna Nagar, Porur, Poonamallee, Kolathur, Perambur, Maduravoyal, Thiruverkadu, Mugapair, Ambattur, Avadi, Thirumullaivoil, Pattabiram, Thiruninravur, Puzhal, Redhills and Thiruvallur Surroundings etc…. Details on Housing Plots, Apartments, Independent Houses, Villas, Ongoing Projects, Home Loans and a range of building products, interior and exterior, etc – facilitating in first-hand information on realty and related markets – are the main features to be showcased. Exclusive forum for visitors is to provide with out-and-out details specific to availing loan under Pradhan Mantri Awas Yojana initiative and for the parents of NRIs, the specific details related to buying property on behalf of their children residing outside the country is to give an advantageous edge. Expecting thousands of footfalls, the fair is to feature information on plots starting from the affordable price range of Rs. 1 lakh to homes from Rs. 20 lakh onwards. Spot loan processing / approvals by home loan agencies; free consultation (between 5 pm and 8 pm) by a panel of experts on government rules and regulations, plan approvals, home maintenance, registrations and gardening, and free exhibition directory with information on the projects and builders of the expo are the other worth-mentioning features. “Ambattur is a great place with huge potential buyers and we are happy to conduct our expo for the 6th time here. As our expos reflect the exact market scenario, throwing light on the developments and market trends, they receive awesome response. Visitors can make best choices that suit their budget, convenience and location,” said Mr. Arasu Alagappan, Organizer, B&C Events.